27/09/2017. 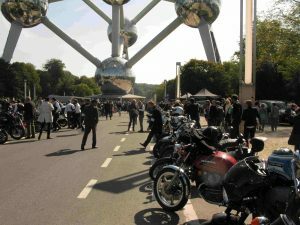 The Distinguished Gentleman’s Ride, or DGR for short, in Brussels this year saw nearly 300 bewhiskered and besuited supposed gentlemen (plus the odd lady) assemble at the Atomium on Sunday prior to a ride into and around the city. The weather for the day was unseasonably sunny and warm, perfect then for a jaunt through the city centre dressed in normally far-from-suitable (for the customarily diesel-clogged streets) collar and tie. The point? 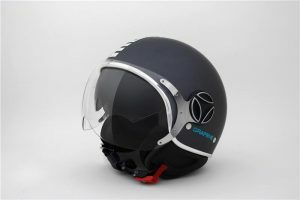 To raise money (over US$ 4.5 million worldwide) for men’s cancer charities. 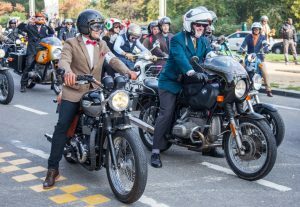 Distinguished Gentleman’s Ride is a relatively new phenomenon. Started by a group of Australian bikers in Alexandria, New South Wales, it has now gone global with riders participating in cities around the the world. 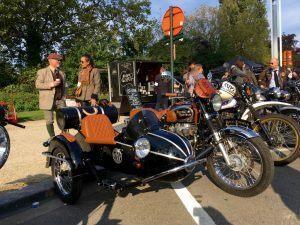 London, New York, Bombay and more – all have their own DGR, which is as much about the (2-wheeled) fellowship of the road as it is about supporting charitable causes. I dutifully turned up at ten o’clock the next morning, and quickly began chatting to Czek Radovan on his Triumph and Omar on his Ducati. It was still cool and misty, which made the atmosphere under the polished globes of the Atomium somewhat atmospheric. Meanwhile, a constant stream of bikers were arriving, until by the compulsory safety lecture at 11 am there were nearly 300 riders ready for the off. 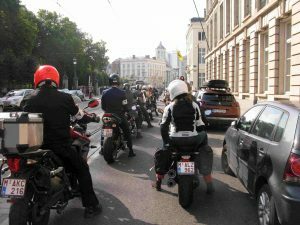 The plan was to ride in convoy into the centre of Brussels, taking a circuitous route around the city and back to the start point. Which is what we did. Averaging around 25 kph, a long stream of riders snaked through the city, while ride marshalls held up traffic at the major junctions to keep us moving. A brief stop on the cobblestoned square of the Palais de Justice gave us a chance to catch a breather, and admire the scaffolding still covering this imperial testament to Belgium’s past. After my 39 year old (and somewhat overheated) BMW had cooled down, off we set again. Waving at crowds, tooting horns, and generally smiling at everyone, I think most of us had a good time. And it was getting so warm that the thermal long-johns no longer seemed such a great idea. Back to the Atomium, and time for a well-earned beer (named Silly, of all things). I met Jamie, another Englishman who was (unlike me) newly arrived in Brussels. Dressed exceedingly well for the part in genuine Harris Tweed jacket, plus fours, stockings and polished brown brogues, he was also sporting a full set of remarkably groomed whiskers. 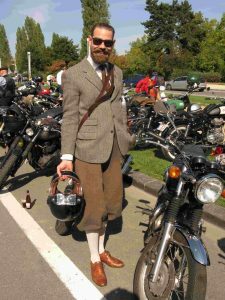 I was not the only one impressed, because Jamie was picked out for the award of best-dressed gentleman, and duly handed a voucher for €250 worth of clothing from Triumph (one of the sponsors). Since the voucher was a large and solid board measuring about 12 inches by 24, taking it away presented something of a transport problem. But it seemed to fit quite well between biker and seat.